The NED Entrepreneurship Society organized the 4th installment of the biggest innovation slam of NEDUET this July, DICE Virtual Innovation Competition 2017. With the motto of enriching the embedded culture of entrepreneurship and innovation in the student body, Team NES arranged the most interesting 3 rounds of competition, inviting renowned names of the innovation and entrepreneurship community to judge the Top teams. 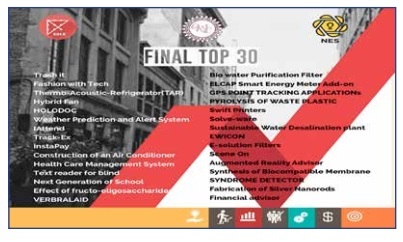 Among 50+ entries received from all over NED University, top 30 ideas were shortlisted on the basis of innovation, use of technology and viability. The selected 30 teams competed in Round 1, held on July 22nd, 2017, called ‘A MINUTE TO PITCH IT’. The format consisted of one member from each team having just one minute to entice the judges and audience with an interesting pitch that not just described the idea but also showed the ‘Think Big’ factor they had. The panel of judges included Mahira Maniar, Huda Baig, Sameer Khan, Zia Saeed, Hiba Ovais Latifee and NED University’s esteemed faculty members. At the end of Round 1, the top 20 pitches were selected for the second round which was held on the 26th of July, called ‘Digital Face-Off’. This round in itself was an innovative idea to assess the market demand of the Top 20 ideas. The teams had the chance to exercise their creative skills and create a one-minute video that visually encompassed the whole idea and the scope of the project. The teams were to get as many likes and reactions on their videos, and on the basis of social media popularity as well as the video content, the Top 12 were selected. The third and final round, held on the 28th of July, was called ‘Clash for Cash’. It was filled with technically impressive presentations by the top 10 contenders. The teams who secured positions from 4th to 10th were rewarded with a cash prize of 5,000, and the Top 3 were awarded with cash prizes of 15,000, 20,000 and 30,000 for 3rd, 2nd and 1st position holders respectively. The Teams presented their ideas in the structure of a business plan. Most of the ideas were statistically found to have interested markets, industries and consumers, willing to utilize the innovative service or product. The judging of the finalists was done by an adept, panel of professionals, including Sana Farooq, Shoaib Iqbal, Talha Ansari, Kanza Batool, Sir Farooq Alam, Qazi Umair, Sibtain, Sunober Cooper and the Chief Guest, MD Careem, and Junaid Iqbal. ABOUT DICE Foundation: DICE Foundation in collaboration with its domestic and international partners, is pursuing a DICE Program in Pakistan, to foster a culture of Innovation and Entrepreneurship in the country and transform Pakistan into an innovation-driven economy. Annual DICE Mega Innovation Event is one of the major initiatives of the DICE Program and has been conducted every year since 2007. The idea behind the event is to motivate academia, industry, government, entrepreneurs and expatriates to come to a common platform to showcase innovations and technologies, share knowledge and further collaborate with each other for the rapid development of innovative products, necessary for the economic development of the country. Besides, DICE Mega event, there are several other focused annual events such as DICE-Automotive, DICE-Water and Energy, DICE-Health, DICE Textile, DICE Agriculture & Food Sciences, DICE CAM, and DICE-Youth organized under the DICE Program. Besides, there are numerous intra-university events that are conducted as well.